Join Our Team! 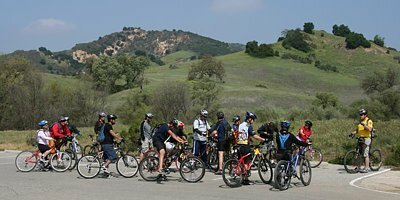 Do you have any ideas about mountain biking recreation in the L.A. region? Would you like to apply your skills and manage projects that contribute to the sport and lifestyle that you love? Is there an advocate in you? We are recruiting motivated individuals who work well with others. Send an email to info@corbamtb.com or come to a monthly Members Meeting to find out more about what we do and how you can help. Check the calendar for the next meeting on the evening of Monday March 16. The Sea Otter Classic, a Celebration of Sport, will be held on April 16-19, 2009 at the Laguna Seca Recreation Area, Monterey, California. This four-day cycling and outdoor sports extravaganza features a full schedule of amateur and pro mountain and road cycling events, as well as family activities for all ages. 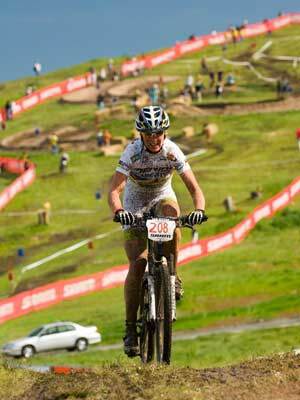 The Sea Otter Classic also plays host to one of the largest consumer bike expos in the world. 15% discount on additional festival passes. Kids 12 and under are free. For more information or to join Team CORBA at this year's Sea Otter Classic, email us at team@corbamtb.com now - time is running out! Recently we were contacted about vandalism at Pt. Mugu State Park. Signage that indicates "no bikes allowed" had been tampered with, including removal of red tape and application of paint over the signs. While we object to inequitable trail-use policies on our publicly-owned land, we also object to vandalism, as it is a destructive and counter-productive means of protest, and is costly to our cash-strapped State Parks and taxpayers to repair. Most importantly, vandalism does not change the current trail-use policies, it only acts to upset the rangers and land managers who ultimately set the policies as to whether bikes are allowed on trails or not. We are also aware of similar forms of vandalism at the Hub in Topanga State Park, where somebody, presumably a hiker, brought liquid paper and wrote "Hike-Not Bike" on the kiosk and the horse hitch. These incidents were likely done by two unscrupulous individuals and it reflects poorly on each user group. There is also vandalism in our parks from non-bikers and non-hikers, just vandals. All of which are shameful and selfish acts of protest. So, if you are upset about certain trails being closed to bikes, what's a guy or girl to do? Work on advocacy with CORBA to address the issue of mountain bike access - the process takes persistence and time, but it is effective. Please enjoy your parks and whenever possible, leave them cleaner than when you arrived. Training is provided on site on the day of the event. Not all volunteer efforts focus on trailwork. 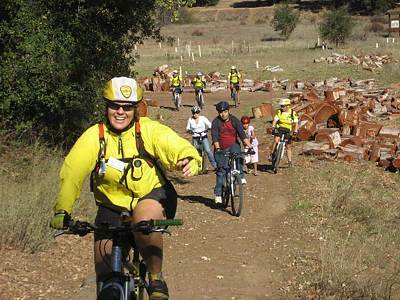 Since 1988, The Mountain Bike Unit (MBU) has worked diligently to build a bike-friendly community in California's Santa Monica mountains. The volunteer-based, non-enforcement, educational patrol has built a strong relationship with the National Park Service (NPS), California State Parks and the Mountains Recreation and Conservation Authority (MRCA). The 2009 MBU recruiting efforts were very successful. 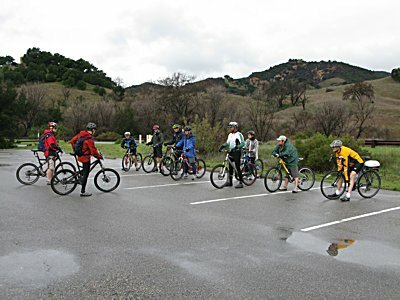 Over 50 mountain bikers signed up for this year training sessions. The MBU's success is direct result of their commitment to high-quality training. During "Scenario Day," new recruits are faced with real-life circumstances created by volunteer actors. Requiring 40-60 volunteers and additional land agency staffers, the training events are impressive undertakings. "Scenario Days are extremely popular ... all the students love it. MBU's commitment to advocacy and service have yielded results. Trail conflicts have been decreasing and mountain bikers are enjoying improved relations with hikers on Santa Monica trails. Especially in places that suffer from strained relationships between user groups, a committed volunteer force can do wonders. A favorite MBU activity that always brings out many volunteers is CORBA's Youth Adventure Program where we provide inner-city and other at-risk kids with a chance to ride some trails in the Santa Monica Mountains. The kids all have a great time and many tell us that they had no idea that places like Malibu Creek State Park existed.